The Formosan subterranean termite gets its name because it was first identified in Taiwan, but it causes plenty of trouble here in South Carolina. Here’s what our Hilton Head termite control specialists have to say about these underground pests. First discovered in South Carolina in the 1960s, Formosan subterranean termites form colonies that number into the millions as opposed to native subterranean species, whose colonies number in the hundreds of thousands. They have never been fully eradicated from an area in which they have established colonies. • Swarmers are approximately half an inch long and have yellowish-brown wings. Like many other insects, they’re attracted to light and can often be found near windows and light fixtures. • Soldiers have a distinctive orange-brown, oval shaped head and secrete a white, sticky fluid as a defense mechanism. • Workers make up the largest proportion of a colony’s population, and they’re responsible for obtaining food, such as cellulose in wood. 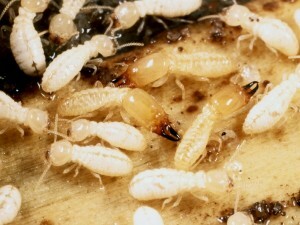 Individual Formosan subterranean termites don’t eat more than other species, but their larger numbers make them a greater threat. Once these termites begin invading homes above ground, you can often find foraging tubes measuring one-quarter to one-half inch in diameter in the walls. Hilton Head termite control is needed year-round. A free 58-point inspection from our certified pest control specialists can uncover signs of termites before damage gets out of hand. Contact us today and find out how you can get $75 off our guaranteed termite protection plan.